Flawed Mom: Get to Sleep, Okay? I know you're not thirsty. That's bulls---. Stop lying. Lie the --- down, my darling, and sleep." 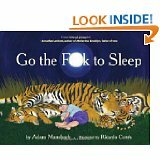 For real, shut the f--- up and sleep." I went to graduate school with Mansbach back in the late Nineties when we were both pursuing that very practical degree, an MFA in fiction writing. I can't remember what classes we took together, but he was brash and funny and had a chic and skinny girlfriend. Though he was clearly white, and supposedly came from an upper middle class suburban family that did something in real estate, he spoke like a drug dealer from the inner city. As it turns out, he was writing a novel called Angry Black White Boy, so I guess he was practicing. He was funny and provocative then, and he's funny and provocative now. His new book will make you laugh. A lot. That said, though I feel for Mansbach, struggling to put a sweet, soft, delicious toddler to sleep every night, I'd like him to come over to our house and see what it's like to get a teenage boy to go to sleep. There's a book in that. Both my kids finished school Friday and my older son, who will be 15 in a few weeks, has decided to do what newborn babies do: He's happily confusing day for night. Yesterday, I came home from a long day of mother-errands, only to find him asleep on the couch at 4:30 p.m., in his boxers and T-shirt from the night before. It was a beautiful day and our dog was outside, wandering around unattended. This all might sound sort of laughable, in the vein of oh-those-crazy-teenagers! except that my son was going to Quebec with his French class at 6 a.m. this morning and hadn't begun to pack. He also had to shower and dress for a barbecue at his school thirty minutes away. Naturally, my younger son had to be at a pool party for his baseball team at exactly the same time. I did my usual "What are you doing?" mother screech and told him to get off the couch. My son compared me to an errupting volcano. Then he mosied upstairs to pack. Eventually, he bagged packing, jumped in the shower and we all got where we needed to go, just forty or fifty minutes late. Then, late last night---as in 1 or 2 a.m. though, who really knows because I was afraid to look at the clock---I heard noise in his bedroom. It sounded like voices. Was it possible he was iChatting this late? Oh, it was possible. I wandered into his room. I reminded him that we had to be up at 5 a.m. so he could make the bus for Quebec. "What the ---are you doing?" I asked. "I'm packing," he said sweetly, as if that was exactly what he was supposed to be doing, which it had been, just ten hours earlier. "Get in bed!" I yelled. I should mention that when my kids were babies, I loved putting them to bed and had no trouble doing it. I nursed them both for a very long time, mainly because I loved having their warm little bodies cuddle next to mine. And because of all that nice oxytocin flowing from my brain into my bloodstream into their milk supply and their blood streams, we all went to bed calm and happy. Once I weaned them, my husband and I took turns putting them to bed (me taking most of the turns), and it was a great pleasure to lie down next to them and kiss them and listen to them talk about their days. Eventually, my older son turned 13 and kicked me out. He told me he was too old for me to lie down with him. He was right. But then he started staying up later and later. Our first mistake was getting him a laptop for his bar mitzvah. Our second mistake was letting him keep it in his room at night. Oh, new parents, never do this! As the months went by, our boy stayed up later and later. Finally, we came to our senses and took his laptop away at 10 p.m. but it took us far too long to come to our senses, and by that point, our older son had established a routine of staying up much later than was good for him. My mother sent him stories from the New York Times Science section about how important it was to get a good night's sleep. My son would read them and say, "Yes, thank you, Grandma, I read the article you sent me." But nothing changed. In the mornings, getting him out of bed involved strong physical labor. I'd begin by kissing his cheek and raising his blinds, but eventually I had to start yelling and yanking his legs out from under his covers---not an easy task, given that he wrestles and is taller and heavier than I am. "I want to see your feet on the floor!" I'd say, as he'd slumber on. He missed the bus more than once and often fell asleep on car rides that lasted more than ten minutes. On the weekends, given his druthers, he'll sleep until 1 p.m. or 2 p.m. And since my younger son hears my older son still going at full speed just when the rest of us are settling down for the night, he wants to stay up late too. It's crazy making. But you can't lie the -- down and sleep?"